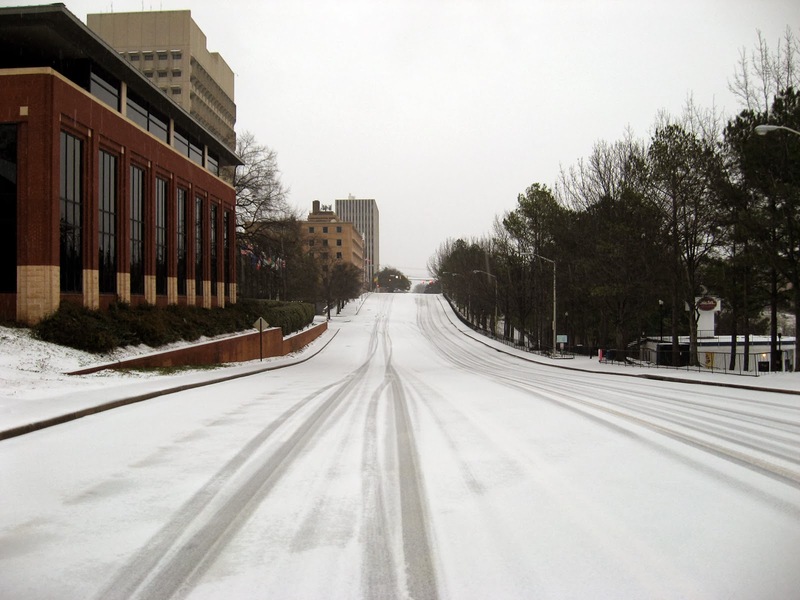 Way back in February, 1988 (our second year living in Columbia, SC), we had a sleet storm. 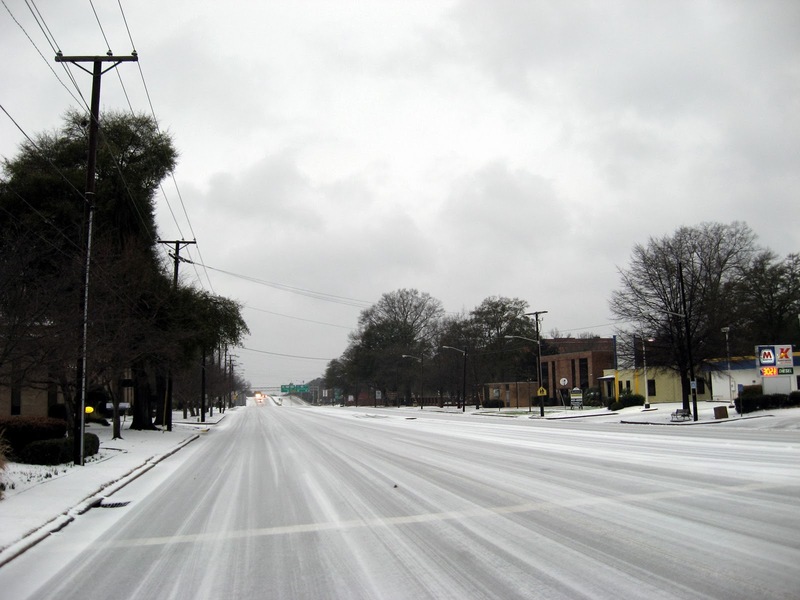 We had 4 inches of sleet which shut down the city for days. I had never experienced such a prolonged period of sleet in my sheltered winter life. My Ohio blood had not thinned so I immediately went driving after work (I did walk the one mile to my office...in my past life I was a coastal engineer and meteorologist and worked for Coastal Science and Engineering until 1990). 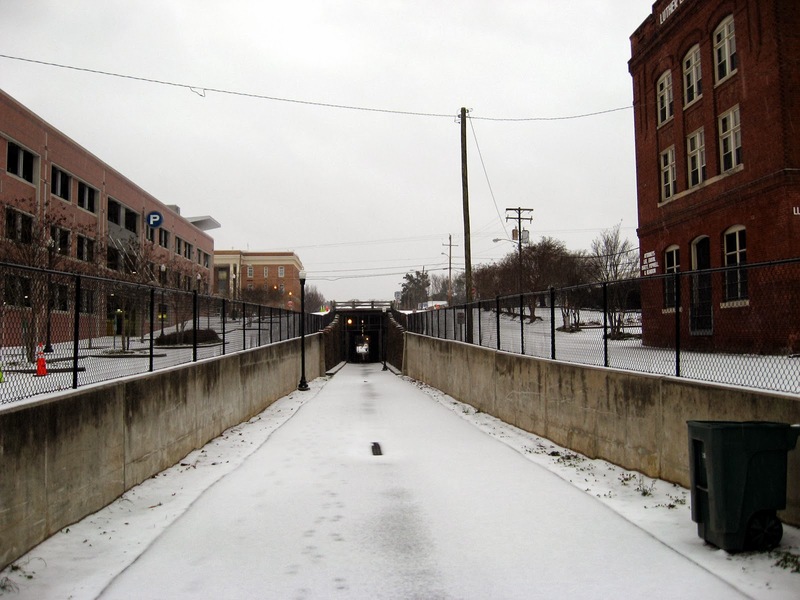 View of the Columbia Greenway looking toward Finley Park at 9AM. The walkway was open! I assumed something would be open, like a bowling alley...they never closed down in Columbus during snowstorms.. but I was wrong. Nothing was open...no one was driving... I remember doing controlled spins on I 126 because NO ONE was on the road. It was so much Fun. Twenty-six years later (oh God have we lived here that long!) we are having a similar ice event. This morning Susan and I walked to her studio on Lady Street and guess what? Starbucks was closed! Everything was closed in the Vista. Luckily the Kangeroo Express Gas station by our house was open and I got my morning newspaper (although I could have stolen all the State and NY Times and Wall Street Journals that were delivered to the closed Starbucks...those wimps). Later today this mess is supposed to change to freezing rain and ice accumulations of 1/2 to 1 inch may occur. This will definitely cripple the city...sleet only freezes on the road but not on the trees and power lines. Power failures are expected. By the way, our cat, Max, "King of Park Street" hates this weather but nature called and he is outside for a little while. If only Shadow was here...I could take her outside and torture her. I hope we do not have this type of weather next week as we will be selling Susan's fiber art at the Baltimore ACC Craft Show (Feb.21-23) and Philadelphia for the Germantown School Craft Show (Feb. 28-March 2). It should be quite an experience.